The Islamic State has claimed responsibility for the Dec. 27 bombing that wounded 13 people in St. Petersburg, Russia. The explosion was quickly labeled an act of terrorism by Russian officials. Russian President Vladimir Putin described it as “terrorist attack” the following day, adding that he had instructed the Federal Security Service (FSB) to detain those responsible if possible. But Putin also gave the go ahead to use deadly force if security personnel or other lives were threatened. The bomb maker reportedly packed the device with shrapnel in order to maximize civilian casualties. An “explosive device stuffed with striking elements was detonated in the Gigant-Hall entertainment center on the first floor near self-storage lockers of the Perekrestok supermarket” on St. Petersburg’s Kondratyevsky Avenue, according to the Russian news agency TASS. 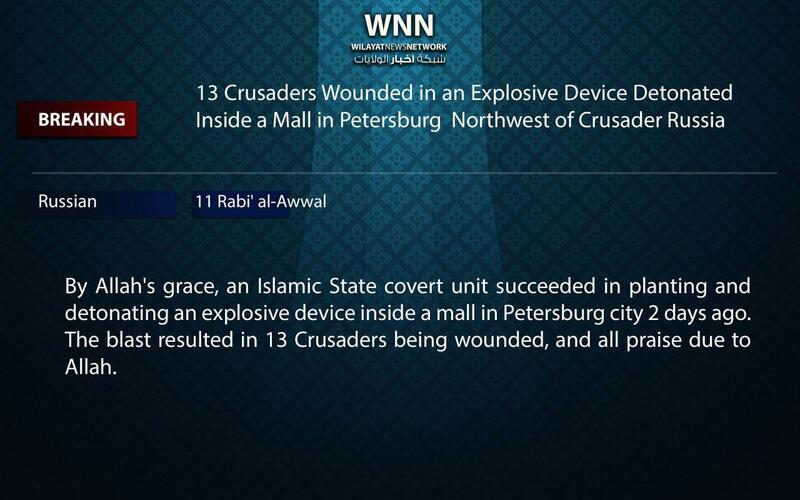 Earlier today (two days after the blast), the Islamic State claimed via its Amaq News Agency and in another statement that its “covert unit” or “detachment” placed and detonated the device in “Crusader” Russia. St. Petersburg has been targeted by jihadists throughout the year. Earlier this month, the Trump administration revealed that intelligence collected by the US had been shared with Russian authorities in order to thwart a planned attack inside the city. During remarks on Dec. 18, President Trump said that he had “received a call from President Putin of Russia thanking our country for the intelligence that our CIA was able to provide them concerning a major terrorist attack planned in St. Petersburg, where many people, perhaps in the thousands, could have been killed.” The call took place the day before (Dec. 17). “They were able to apprehend these terrorists before the event, with no loss of life,” Trump added. It is not known if the Dec. 27 blast is tied to the same network that American and Russian officials rolled up just weeks earlier. On Apr. 3, a bomb was detonated on a metro train in St. Petersburg, killing fifteen people. Akbarjon Jalilov, an ethnic Uzbek born in Kyrgyzstan, was identified as the perpetrator. A previously unknown group named Katibat Imam Shamil claimed responsibility for Jalilov’s suicide bombing later that same month. The group’s statement was posted on al Qaeda-affiliated social media channels, including the Global Islamic Media Front, and also republished in Al Masra (an al Qaeda newsletter). Katibat Imam Shamil identified Jalilov as one of its members and described him as “one of the knights of Islam.” The purported organization claimed that Jalilov was dispatched “under the directives of Sheikh Ayman al Zawahiri” and al Qaeda, arguing that the attack was revenge for Russia’s “support” for the “criminal” Bashar al Assad regime in Syria and other actions in Chechnya and Libya. Many of the details surrounding the St. Petersburg metro bombing, including whether Katibat Imam Shamil was a real outfit or a front, remain unclear. Jihadists have struck inside Russia on other occasions since last year. The Islamic State has targeted Russian civilians elsewhere as well. The self-declared caliphate’s Sinai “province” downed a Russian airliner after it departed from the Sharm El Sheikh International Airport, killing all 224 people on board. The group claims to have used a simple improvised explosive device to down the jetliner. One should expected ISIS and al Qaeda affiliates to continue Phase 1 & 2 insurgency acts such as these. Doubtful that they will ever get to a war of movement again although they could try in places like Nigeria/Sahel, Somalia or Libya.